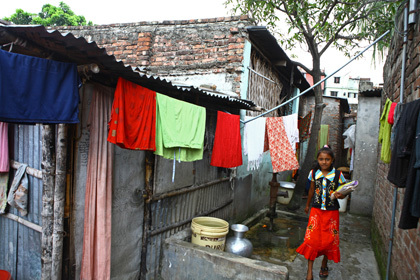 In Bangladesh, family poverty and poor quality state education forces millions of children out of primary school. Girls in particular lose out as they are often the first to be called on to get a job or help their parents at home. But a new project of flexible learning centres is hoping to change this as Aasha Mehreen Amin found when she visited two centres run by the Dhaka Ahsania Mission. 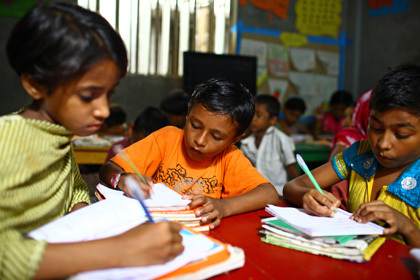 A maths class is in full swing inside a Child Learning Centre (CLC) in a slum area of Sheorapara, Dhaka City. There are four tables where students, aged eight to twelve, sit immersed in their work. Jannatul (which means ‘heavenly’ in Arabic) is a round-faced, wide-eyed twelve year-old girl wearing a threadbare shalwar kameez. Jannatul is one of the lucky ones. Every few steps along the alleyways near the learning centre, there are clusters of little children playing in the dust. Many of the older ones say they don’t go to school. Jannatul gets up in the early hours and works before going to school at nine, returning to the stall after school and finishing around 9pm. 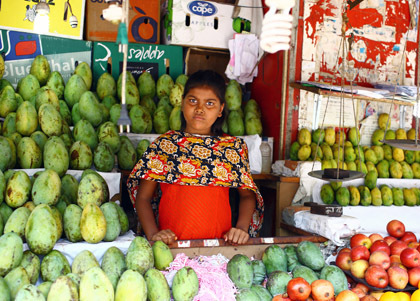 Dark circles under her eyes betray the long days she puts in carrying the heavy crates of fruit, which she must sort, unpack and sell. For all her hours, she takes home only 20 Taka a day, [less than 20 pence]. Part-time attendance at the centres gives children a fighting chance of staying in school. 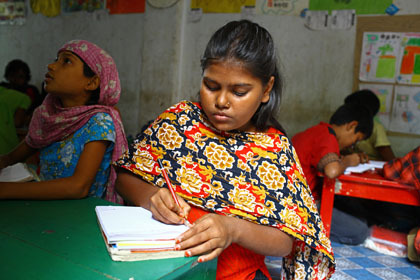 Professor Rezina Sultana, former principal of a teacher training college in Dhaka, says the scheme is likely to provide new opportunities for girls – “Families still have high hopes for their boys, but don’t expect so much for their daughters, so if they see something is more flexible they are willing to give their girls a chance”. Helena, in fact, is quite a celebrity among her students who are obviously deeply attached to her. “They are so good and if I fall ill, they will go to a phone shop to call up and ask how I am and if I will be coming to school or not. It is amazing.” Meanwhile, if a child doesn’t turn up, the class teacher will visit the child’s house to ask her guardian why she didn’t attend class and then writes the reason in a ‘home inspection’ book. Ibrahimpur’s learning centre is in a small rented room within a cluster of one-roomed houses; Helena’s classroom is clean and cheerfully adorned with colourful posters, alphabets, numbers and motivational words, as well as an array of drawings by the students. Each class generally has 25 students and is divided into four subject groups which roughly translate into the first, second and third grade of school. “It is a multi-grade system”, explains G. F. Hamim, the coordinator of this project (called UNIQUE) run by Dhaka Ahsania Mission. “It allows each child to be assessed and taught according to his or her proficiency,” he says. “If, say, a child has reached Class 3 competence in mathematics, but has Class 1 proficiency in Bangla then the teacher will teach her accordingly, until her Bangla reaches Class 3 level.” The set books are all National Textbook Board texts taught in the formal system and the project, aims to help these children to continue their education by enrolling them into regular primary schools after they complete the CLC course. At Ibrahimpur Centre, it is Thursday and ‘cultural day’. Two sisters take the lead in a number of song and dance numbers. They go on to perform a song, “We are the future citizens, we will lighten the darkness, we will carry the torch of knowledge,” they sing. For the children at these centres there is a good chance they will. In many urban slums and rural villages where non-formal learning centres operate, there are no other schools at all. They often provide the only opportunity for poor children to complete primary education. The small classes, female role models and creative approach of the non-formal learning centres make the schools attractive to girls and are ideal for children with learning difficulties. The fact that they are closely monitored means they are less likely to drop out. An estimated 90 per cent of these children go on to secondary school. There are approx. 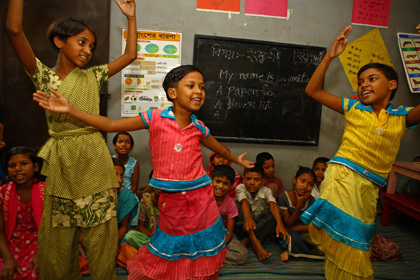 19 million primary school-aged children in Bangladesh – one of the largest student populations in a developing country.